After one of the most exciting and competitive VMSL Premier Division seasons in many a year, it was perhaps fitting that the championship was eventually decided in a final week of drama, with more twists than a M Night Shyamalan movie. At the end of it all, Croatia SC were the team left standing tall, becoming 2018/19 VMSL Premier Division champions thanks to a dramatic stoppage time winner from Mark Malamura in their final match of the season. Heading into the final set of matches, three teams still harboured title aspirations, with just one point separating them. And with two of those teams playing each other, you knew it was going to be a dramatic climax to the season. And so it proved to be. Croatia SC were out on top with 45 points, with Rino’s Tigers and CCB LFC United a point behind in second. With Croatia and Rino’s facing off against each other in their final league game, and with CCB having two matches left to play, the math was simple and the advantage was firmly in the hands of the Surrey side. If CCB won their final two matches, they would be crowned champions. The Point Grey Turf was the venue for the 1st v 2nd clash between Croatia and Rino’s on Saturday afternoon. It was an entertaining game from the start, with both teams carving out scoring opportunities from their dangerous attacks, but squandering great chances to get the early goal. As the first half went on, Rino’s started to dominate possession and were creating the better chances, although Croatia were looking the more dangerous in front of goal. Neither team could break the deadlock though and headed into half time tied at 0-0. Croatia started the second half well, crashing a corner off the crossbar, but then Rino’s turned it up a notch and should have been out of sight if they had taken just a few of the goalscoring opportunities they made for themselves. They couldn’t even take one, however. Croatia were having to look for the quick counter, and looked a real threat on the ones they had, but the Rino’s defence handled them well on the whole, but a few goalmouth scrambles had the hearts of both benches racing. As the game headed into stoppage time still scoreless, it looked like a stalemate would be the order of the day, unlikely to help either team in their quest for the title and definitely ending the Tigers chances. Croatia won a late corner though and as the ball bounced around the box in another scramble, substitute Mark Malamura had two bites at it, firing home the second of them in the 92nd minute to spark jubilant scenes both on and off the pitch. And although they weren’t to know it then, that dramatic late winner proved to also be the championship clincher for Croatia, as they held on for a famous 1-0 victory. You can also find some more photos from the match over on our Flickr page. League leaders Croatia had done all they could do and were sitting four points clear at the top after their 22 matches. All they could do now was to sit back and wait. 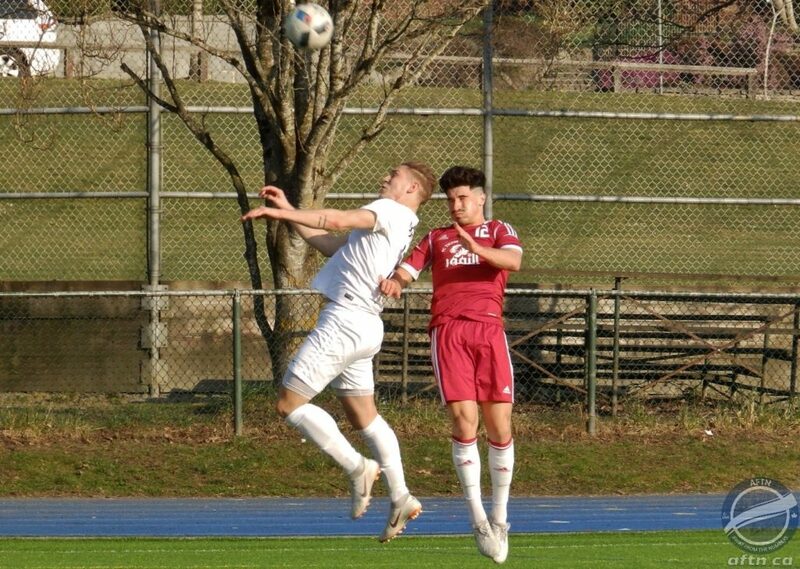 With the snow disrupting the schedule, CCB still had two matches of their season left to play, taking on Surrey rivals Pegasus SFC on Tuesday night at Newton, and Club Inter EDC Burnaby on Friday night at the same venue. Two wins and the title was theirs. A win and a draw and a playoff loomed to decide the title. A loss in either match and Croatia would become champions. There’s not a lot of love lost between CCB and both of those teams, so they knew they’d be in for a battle in both matches. 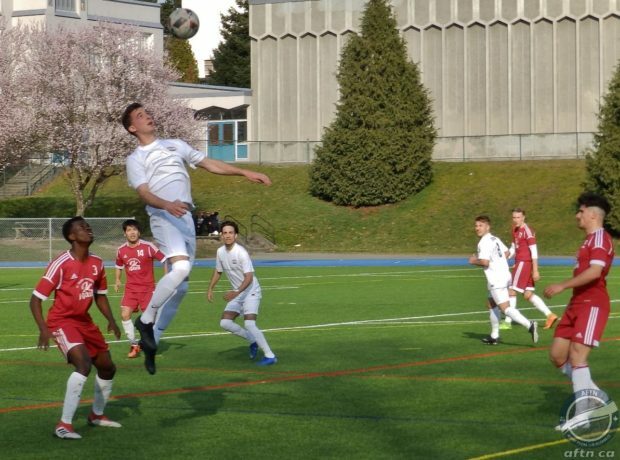 As things transpired though, Friday’s game, which had looked like being the league decider became irrelevant, as Pegasus shocked CCB, puting in a solid showing to come away with the 1-0 victory thanks to a first half goal from UBC Thunderbirds defender Jora Saran. CCB had their chances but just couldn’t find the back of the net and saw their title dreams ended by their Surrey rivals in what has to go down as a shock result. You can see the goal and some other first half highlights in VMSL’s instagram post below. What an end to the season between the three teams that certainly played the best football we saw all year. Congratulations to Croatia, who battled to the very end and deserve their championship.